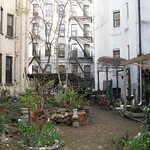 The 11BC Community Garden is located in the vibrant East Village neighborhood in downtown Manhattan. Locally referred to as the "shady" garden, 11BC mainly serves as an open and friendly communal hub where musical, arts, educational, and other various events are held throughout the months, beginning in May and ending in early October. Local residents and friendly passers by are welcome to visit the garden on Tuesdays and Thursdays from 9am-5pm and Sundays from 1pm-5pm or anytime a garden member is present and the gate is open. Public events are occasionally held on Saturdays, also. 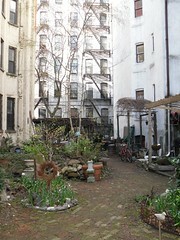 The 22 official members of the garden are positively demographically diverse and mainly composed of near-by residents .The 11BC garden is also a NYC Compost Project demonstration site and strongly supports the reuse of donated materials to add to the garden's beauty.